Refuting the Opposition charge that the Centre was afraid of making public Nanavati Commission report on the 1984 anti-Sikh riots, Union Home Minister Shivraj Patil said today that his ministry had already decided on the actions to be taken on the report that would soon be presented before the Union Cabinet and Parliament. BJP workers stage a dharna demanding the release of the Nanavati Commission Report on ’84 riots in New Delhi on Wednesday. There is no sign of election activity in the district Congress office in Dhanbad, although the polling day is barely a week away. A group of workers were sitting in a corner discussing how the party had hurt itself by its flip-flop in announcing candidates. The last phase of poll will determine which party will form the next government in Patna as the ruling RJD will have to retain at least 40 seats if it wants to remain in power in the state. 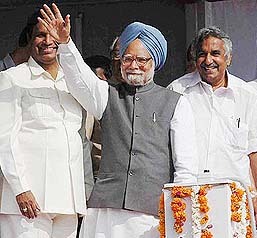 Kerala looks set to receive Central investments to the tune of Rs 20,000 crore with Prime Minister Manmohan Singh today laying foundations of a container transhipment terminal at Vallarpadam and a power project at Kayamkulam, besides announcing plans for more projects. Under heavy attack from his party colleagues, allies and the public for the ongoing demolitions in Mumbai, Maharashtra Chief Minister Vilasrao Deshmukh has been told by Congress President Sonia Gandhi to resolve this issue in the state itself and to adopt a more humane approach to this problem. The National Hydro Power Corporation has reportedly awarded 2000 mw Subansiri mega power project in Arunachal Pradesh to M/s Alstom of France despite objections by a Union Cabinet Minister and adverse remarks by the Solicitor -General of India. BJP Leader L.K. 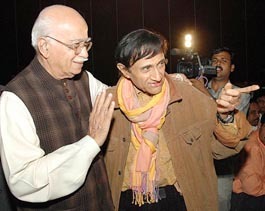 Advani greets veteran Bollywood actor Dev Anand during the screening of his daughter Pratibha Advani's film Ananya Bharti, in Mumbai on Tuesday. India is likely to face stiff pressure from rich countries to bring down its greenhouse gas emissions, under the Kyoto Protocol coming in force from today. Under the Kyoto Protocol, 39 developed countries are legally bound to reduce greenhouse gas emissions by 5.2 per cent of 1990 levels by 2008 to 12, but developing nations, including India and China, were exempted from the treaty’s emission targets. The international treaty was signed in 1995 making it mandatory for the developed countries to reduce greenhouse emissions with effect from February 16, 2005. Justice M.N. Mukherjee Commission, probing the mysterious disappearance of freedom fighter Subhas Chandra Bose, today heard deponents’ arguments that the alleged air-crash in Taihoku airport on August 18, 1945 ‘’could not have happened’’ and that Gumnami Baba of Faizabad was ‘’none else but Netaji’’. Spiritual leader Mata Amirtanandamayi has announced that her mutt would adopt Pattinacheri and Ammankoilpathu — two villages in the Karaikal region affected by the tsunami tragedy. The Supreme Court has directed the Punjab and Haryana High Court to hear afresh a bail issue on merit, disagreeing with its full Bench judgement setting aside an order of its single judge merely on the question of doctrine of coram. Reacting sharply to the Haryana Government’s move to reconsider the decision on distribution of Yamuna waters, the Rajasthan Government has implored the Centre to intervene to ensure the supply of its share as per agreement signed by the Governments of UP, Haryana, Rajasthan, Delhi and Himachal in May, 1994. RJD candidate from the Maharajganj Assembly constituency and sitting MLA Umashankar Singh’s son and his seven associates were arrested and a huge cache of firearms was recovered during a police raid in Bihar’s Siwan district today. Elephant festival draws hundreds to Kaziranga. 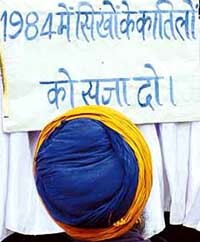 Refuting the Opposition charge that the Centre was afraid of making public Nanavati Commission report on the 1984 anti-Sikh riots, Union Home Minister Shivraj Patil said today that his ministry had already decided on the actions to be taken on the report that would soon be presented before the Union Cabinet and Parliament. Besides, the Centre has decided to constitute a commission to take a fresh look at Centre-state relations, he said. “The Home Ministry had studied the suggestions and recommendations made in the report and finalised the actions to be taken,” Mr Patil said at a press conference organised by the Press Association of India here. “The actions to be taken will be discussed among the Council of Ministers and an action taken report will be prepared to be placed in Parliament along with Nanavati report,” he said. “There is a specified procedure laid by the law under which the parent ministry studies the report and decides on the actions which are discussed in the Cabinet,” the minister said while categorically denying that the government was trying to suppress it. In the past also, the Centre had set up the Ranganath Misra Commission to probe the anti-Sikh riots and subsequently six committees were formed. The suggestions of all these were taken into the account then as per the laid procedure, he said. The terms of reference of the commission were being worked out by a Group of Ministers (GoM), Mr Patil said. The minister pointed out that except 50 or 60 recommendations, given by the Sarkaria Commission for a smooth functioning of the Centre-state relations, the rest had been accepted and acted upon. He made it clear that the Inter-State Council had not accepted the recommendations of the Sarkaria Commission in this regard. The minister said a debate was still on whether the Centre should merely inform the state governments about the person to be appointed as Governor or it should provide a list of names to the state concerned to choose from or leave it to the state Governments to suggest names for appointment. “...and there is no consensus on this issue,” he added. On the demand for greater autonomy in Jammu and Kashmir, which had been raised by National Conference leaders Farooq Abdullah and his son Omar Abdullah during a recent meeting with him, Mr Patil said the Centre was willing to discuss all issues, including those relating to tax, revenue collection and certain other legal matters. “These issues can be taken up at meetings of the National Integration Council, those of the chief ministers and at the level of the Prime Minister. They can also be discussed by the new commission being set up to look at Centre-state relations,” he said. To a question if the Centre has extended an invitation to the Hurriyat Conference for talks, the Home Minister said the Centre would be holding a dialogue with elected representatives in Jammu and Kashmir, leaders of political parties, professionals and groups belonging to the Kashmir valley and Ladakh. “We will talk to all concerned. This policy will continue. If some group expresses unwillingness to talk, we will not stop talking to others,” he said, adding that “the Centre will hear their views and whatever can be done will be done”. Mr Patil said a draft on a Bill to deal with communal violence was being finalised by the Law Ministry. The draft would be made public and views of the people taken before introducing it in Parliament, he said. The workers yesterday, performed the last rites of DCC office secretary Thakur Prasad Singh Chaudhary , a worker with 40-year service to the party, who died of brain haemorrhage as he fell off a stool in the district office. The Congress has changed its candidate thrice in Dhanbad. First, Mr Upendra Singh, a youth leader, was declared the party candidate on January 13. Two days later Mr Ajay Dubey was declared the party candidate. On February 4, the party made another announcement declaring Mr Mannan Mallik as its nominee. A miffed Mr Upendra Singh is now in the fray as an independent candidate. The BJP leaders feel it is a cakewalk for the party candidate Mr Pashupati Nath Singh, a minister in the Arjun Munda government. Dhanbad is not the only place where the Congress leadership displayed fickleness in deciding nominees. In the neighbouring Tundi, the party first announced Mr Uday Singh, as its candidate. But opinion changed at the last moment and Mr Nawal Singh was named the party candidate. The decision was so late that the requisite documents could not reach Mr Nawal Singh in time. The faxed message he attached was not considered good enough by the returning officer. Ultimately, it is Mr Uday Singh who is carrying the Congress banner now. Party insiders count seven seats in the state where candidates were changed . The seats are mostly those where the BJP has strong presence. Mahila Congress leader Pratibha Singh was the first choice in Hatia but the ticket was given to Mr Gopal S. N. Shahdeo. The party leadership kept changing its opinion in Jamshedpur East till Mr Ramashray Prasad was declared the candidate. In Jharia, the party leadership seemed in a mood to leave the seat for Left parties till an announcement was made in favour of Mr Suresh Singh. Changing stance of the party leadership seems to have cast its shadow on the morale of the Congress workers besides sending a wrong message among the electorate. "Even if candidate was perceived as weak, the party should have stuck to its first choice. People primarily vote for the party." says Mr Arun Kumar Singh, a office-bearer of a district Congress committee. The Congress workers say that the changing mood of the electorate is reflected in the results of exit polls. "Before the elections, the Congress-JMM combine was shown to be winning nearly 60 seats. The number has now come down to 38," says Mr Ram Prakash Sharma, DCC chief of Dhanbad. The Congress nominee from Dhanbad Mannan Mallik seems to be going about his campaign without too much involvement of the district Congress office-bearers. Of the six seats in Dhanbad district, the Congress seems to be in close contest only in Jharia and Bagmara. The Rashtriya Janata Dal's sitting MLA Saba Ahmad seems to have an edge over the rivals in Tundi while the Marxist Coordination Committee and All -India Forward Block seem to be the main contenders in Nirsa. This region has a large presence of the working class. The BJP has replaced its sitting MLA Fulchand Mandal in Sindri where its main contest is with the JMM. Bokaro has the maximum 53 candidates in the fray, the contest is mainly between the RJD's Bachha Singh and Samresh Singh of the Jarkhand Vananchal Congress. Mr Samresh Singh had won the seat in 2000 elections as an independent. The BJP has left three seats for the JD(U) in Bokaro and Dhanbad districts. The BJP insiders say a "weak candidate" had been chosen in Tundi due to internal wranglings in the state unit. The party cadres are unhappy at the Chandankyari seat having been given to the JD(U). They feel the party was in a better position to take on Mr Haru Tajwar, the sitting MLA of JMM. The Congress is strongly placed in Bermo of Bokaro district where the Congress Legislature Party leader Rajendra Prasad Singh is in the fray. The party has won the seat in the last three elections. The BJP-JD(U), which had four of the 10 seats in Bokaro and Dhanbad districts in 2000 polls, look set to retain the number. The BJP is keeping up momentum of its campaign in the third phase elections for 28 seats on February 23, with senior leaders Mr Atal Bihari Vajpayee and Mr L.K. Advani scheduled to address rallies. The party has also planned a joint campaign by Chief Minister Arjun Munda and former Chief Minister Babulal Marandi. Both Prime Minister Manmohan Singh and Congress President Sonia Gandhi are likely to campaign for the Congress candidates in the third phase of elections. Of the three phases of elections in Jharkhand, the last phase has the maximum voters. The Election Commission has set up 6,171 booths for over 64 lakh voters who are eligible to exercise their franchise in eight districts of the state on February 23. The area, where election for the scheduled 93 Assembly seats is going to be held in the last phase, north of Patna, constitutes of 11 administrative districts bordering Nepal and Uttar Pradesh. Majority of the Assembly constituencies going for election next week, fall in the 12 Lok Sabha seats of Muzaffarpur, Nalanda, Vaishali, Hajipur, Chapra, Sheohar, Gopalganj, Sitamarhi, Siwan, Motihari, Barh and Patna. The RJD had won 8 of these Lok Sabha seats in 2004, general elections. In 2000 Assembly elections, the RJD had won 40 seats while the BJP along with Samata Party and JD (U) had a tally of 34 seats. The Congress, which had contested without an alliance, had won 3 seats. The secret of success or defeat in these constituencies will depend on Muslims votes. The contests are multi-cornered as the NDA is challenging the RJD supremacy but many political parties like the BSP, SP and others have fielded their candidates. Even the LJP with the Congress is trying to wrest away the traditional RJD Muslim votes. In almost every constituency, Muslim votes range between 9 and 18 per cent. Yadavs' presence is estimated to be between 10 and 18 per cent. In the three Lok Sabha constituencies of Nalanda, Barh and Muzaffarpur, JD (U) leader Nitesh Kumar has his decisive say as Kurmi voters range between 11 and 9 per cent. Exit polls have put the RJD and the NDA at par have created a unique situation in the state. The RJD supremo along with Chief Minister Rabri Devi have begun working overtime to reach out to voters to arrest the drift of voters while Nitesh Kumar has swung into action reaching out to maximum number of voters. The campaign programme of Mr Laloo Prasad Yadav, Ms Rabri Devi, Mr Nitesh Kumar, Mr George Fernandes, Mr Digvijay Singh, Mr Sushil Kumar Modi, Mr Ramvilas Paswan are scheduled to hold meetings, and each of them will address at least 50 meetings in the next five days. Each party is also bringing film stars for campaigning. Meetings of national leaders like former Prime Minister Atal Bihari Vajpayee, Congress President Sonia Gandhi, and BJP President L.K. Advani are also expected to address meetings. The NDA leaders are trying to impress upon voters that the state might be pushed into a period of instability if they did not give a clear mandate. The BJP has asked the RSS to instruct its cadres to mobilise the electorate for putting an end to the RJD misrule, sources said. Mr Ramvilas Paswan, who is expected to play a role of a king maker in the post-election scenario, today held a meeting with his Muslim leaders and supporters. It was decided that efforts should be doubled to consolidate the Dalit-Muslim unity. The sources said Mr Paswan also met some prominent Bhumihar leaders for ensuring the support of the community which has 6 to 7 per cent votes in 80 per cent of the constituencies. Unable to gauge the electorate's mind, political leaders have also started firing psychological weapons. Coming five days are sure to witness a bitter struggle for votes but which way the electorate will go is difficult to predict, as barring committed supporters, others are not prepared to reveal their mind. The Rs 3,000-crore International Container Transhipment Terminal at Vallarpadam and the Rs 7,584-crore second phase of NTPC’s Rajiv Gandhi Combined Cycle Power Project at Kayamkulam are part of planned Central investments worth Rs 20,000 crore. The Prime Minister announced at Kayamkulam that the Gail (India) Ltd was exploring the feasibility of setting up a Rs 7,000-crore gas cracker complex in the state jointly with the Kerala State Industrial Development Corporation (KSIDC). A Rs 2,300-crore LNG re-gasification terminal was also being planned to be set up at Kochi to source fuel for the NTPC plant. Laying the foundation of the much-awaited Rs 3,000-crore ICTT project, Mr Manmohan Singh urged Kerala to adopt a “pro-active” approach in taking full advantage of the increasingly globalised economy and utilise its untapped potential. The success of the project would depend on how well the public-private partnership was managed, he said. “The efficient blending of private sector managerial efficiency and marketing acumen with public sector capital and infrastructure planning should make this project a role model for private-public partnership,” he said. The ICTT project would make India a transshipment hub of the region, he added. The Prime Minister said there was a need for coordinated development of major and minor ports and that the Shipping Ministry’s proposal to provide financial assistance for the development of minor ports would be given due consideration. The infrastructure created by the ICTT would also provide an economic platform to bring about the development of six other maritime-related projects, including port-based special economic zone, LNG/cruise/bunkering terminal, single boy mooring and a ship repair complex, he said. Mrs Gandhi, who conveyed her concern to Mr Deshmukh in a telephonic conversation with him yesterday, is also learnt to have advised him to adopt a more cautious and humane approach on this matter, especially in view of the protests triggered by this controversial move and the political overtones it has acquired. The Congress has reason to be concerned about this growing controversy as it positioned itself as a pro-poor party in the last Lok Sabha elections with the now-famous campaign slogan,”Congress ka haath, aam aadmi ke saath.” The AICC leadership has, therefore, asked Mr Deshmukh to ensure proper rehabilitation of hutment dwellers wherever demolition is unavoidable for development projects. Mr Deshmukh and Maharshtra PCC chief Prabha Rau were initially tipped to come to Delhi today to personally apprise Mrs Gandhi about this issue. Apparently not wanting to get involved in state matters, Mrs Gandhi asked them not to rush to the Capital and were instead urged to tackle it in the state itself. The first phase of the 6500 mw power project, the largest hydel power project in South Asia, is estimated to cost Rs 1600 crore in which several leading companies, including BHEL, were bidding for it. CPM leader Dipankar Mukherjee in a letter to the Prime Minister, Dr Manmohan Singh, today sought the immediate “intervention” in the matter and “stalling the award” of contract to Alstom. The Union Heavy Industries Minister had earlier pointed to several drawbacks in the bid of Alstom in the power project. Mr Dev had alleged that the French company had stated that their share in the consortium was only 34 per cent, which was a direct contravention of the qualification criteria. India is likely to face stiff pressure from rich countries to bring down its greenhouse gas emissions, under the Kyoto Protocol coming in force from today. Under the Kyoto Protocol, 39 developed countries are legally bound to reduce greenhouse gas emissions by 5.2 per cent of 1990 levels by 2008 to 12, but developing nations, including India and China, were exempted from the treaty’s emission targets. The international treaty was signed in 1995 making it mandatory for the developed countries to reduce greenhouse emissions with effect from February 16, 2005. Developing countries, including India and China, had argued that their economies would be badly hit if they were to change their energy policies. However, after the sharp rise in oil demand over the past one decade, leading to rise in the pollution level, the country is already recognised as one of the biggest polluters in the world. It is under pressure from the rich nations to bring down greenhouse emission levels. As the economy grows and the demand for fossil fuel rises, the country with a population of over 100 crore is projected to account for a larger share of global carbon emissions. Since India has ratified the Kyoto Protocol, the government has moved swiftly on clean development mechanisms (CDMs) and is positioning India as a leading developing country with the capacity to provide huge potential of carbon emission reduction (CER) to the Annex-1 countries. The Petroleum Ministry has already instructed the oil marketing companies to ensure the supply of petrol and diesel from April 1 with reduced level of pollutants. The government is likely to resist the pressure at least during the first phase till 2012 otherwise the country will be forced the buy high cost cleaner technologies affecting the growth rate. In the second phase, the countries will be forced to commit deeper emission cuts. Notably, for the first time ever the world will have a legally binding international treaty with a compliance system to reduce emissions of climate polluting gas and fight climate change in a globally concerted way. During the arguments put before Mr Justice Mukherjee, Chairman of the one-man Commission, Prof Nandalal Chakraborty, a veteran Netaji researcher, armed with supporting documents, tried to prove that there was no plane crash at the Taihoku military aerodrome on August 18, 1945, in which, ‘’many unjustifiably believed’’ that Netaji was killed after suffering severe burn injuries. The entire plane crash theory was ‘’systematically” circulated’’ by the then Japanese authority as a cover-up measure to ensure a safepassage to Netaji to a safer country”, Prof Chakraborty said and submitted various documents, including Russian and Taiwanese archival materials, to drive his point home. Amritanandamayi, who reached Pattinacheri from Nagapattinam yesterday, met the affected people who were staying in temporary shelters. Later, addressing the affected people at Karaikalmedu village, she announced that the mutt would adopt Pattinacheri and Ammankoilpathu villages and efforts would be taken to make them as ‘model villages’. A Bench of Mr Justice D.M.Dharamadhikari and Mr Justice B.N.Srikrishna directed the High Court to hear the bail petition of Arjun Malhotra afresh on merit, after his counsel Punit Bali had raised an important question whether a full Bench could pass such a direction when it was constituted suo motu without giving any notice to the petitioner. Setting aside the order of the single judge, granting bail to Malhotra, the full Bench of the High Court in its order had stated that the case ought to have been listed before a Division Bench in accordance with the High Court rules. “The doctrine of Coram-non-judice has been applied,” in the case, it said. The petitioner’s counsel had also raised a question of law whether a direction from the administrative side could be issued by the Chief Justice to constitute a full Bench suo motu to interfere in a judicial side order, without there being an application for the cancellation of bail in a case. The second question raised in the matter was whether the bail of a person once granted, could be cancelled without there being any notice to him. State Minister for Irrigation, Prof. Sanwar Lal Jat, in a communication addressed to the Union Minister for Water Resources, Mr. Priyaranjandas Munshi, has pleaded that any change in the decision detrimental to the interests of Rajasthan would be a blatant violation of the agreement which provided for 1119 BCM of water for Bharatpur, Churu and Jhunjhunu districts of the region through canal systems. Mr. Jat has stated that in spite of repeated requests, the Haryana Government has not signed the MoU in respect of construction of the canals and now it has filed a petition with the Upper Yamuna Board for amending the agreement. Mr. Jat has also invited the Centre’s attention to the fact that a meeting between the Chief Ministers of Haryana and Rajasthan held in June, 2001, had envisaged joint inspection by officials of the two states and the Central Water Power Commission to take a decision on the construction of a canal system for the purpose. The attitudinal change of the Haryana Government on the Yamuna waters issue was also raised in the State Assembly yesterday. Dr. B.D. Kalla, a Congress leader, stated that while proposals worth Rs.1100 crore had already been prepared by the Gehlot Government for the construction of the canals , the present BJP Government had shown utter indifference in the matter.